Medicine Gray jar from the Museum of Northern Arizona collections. Click the image to open the Medicine Gray gallery. 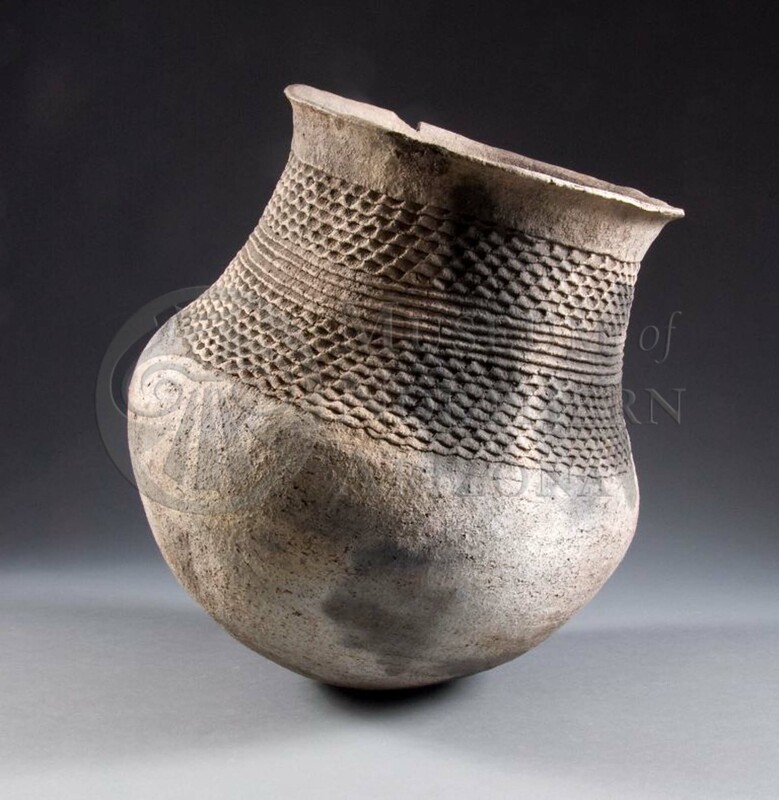 Medicine Gray is a type of Tusayan Gray ware that was produced mainly in northeastern Arizona. Surface Finish: Very rough; scraped; not smoothed; not polished; often deeply pitted; scraping marks conspicuous; neck coils unobliterated on exterior surfaces; sometimes slightly finger-dented; usually varies from about 3 to 5 mm in width. Vessel Thickness: 2.5 to 6.4 mm; average 4.3 mm. Comparisons: Lino Gray coils are always unobliterated over the entire surface; body and base sherds are indistinguishable. Kana’a Gray exterior neck surfaces have unobliterated coils without finger-indentations, and the coils are usually wider; body and base sherds are indistinguishable. Coconino Gray, Honani Tooled, and O’Leary Tooled have exterior neck surfaces decorated with tooling marks; body and base sherds are indistinguishable. Kiet Siel Gray usually has coarser temper with opaque angular fragments, surfaces that are less well-smoothed (usually bumpy), coils that are sometimes not quite obliterated, and thicker vessel walls. Colton, Harold S. (1955) Pottery Types of the Arizona Strip and Adjacent Areas in Utah and Nevada. Museum of Northern Arizona Ceramic Series No. 1. Flagstaff, Arizona.